…a gaudy room that reminded me of a theatrical backdrop. Places like this are overdone, for my taste, but some people like the exotic…well, everyone is a critic. It’s true, I am by nature extremely critical. Although my life is a lonely one I have not spared any of my guests the rigor of my judgment…. We all have our roles to play. ● The solutions above could work together, although the red herring theme seems to suggest that we not take seriously the stop theme. The following solutions works with either or both of the above theories: The H+OO spells 38 alphanumerically if read from bottom up like the WOMANSJEWELRY sign. H=8 + O=15,O=15 indicating door 38. [Independent Credit: Kon Tiki | also Katherine & Nova] On the opposite side of the room the scales-sign could indicate door 43. The 4 (on the left) is more than the 3 (on the right), thus a scale weighing the two numbers would tip to the left. [Credit: White Raven] The tail could also be seen as pointing to door 43. [Credit: Aria] Thus both doors are indicated therefore the clues are red herrings AND/OR both doors are indicated reinforcing the conclusion that one should stop here. My friend and I always called this the Poseidon Room. As has already been discussed, the signs all seem related to water, and the pitchfork on the seat looks suspiciously like a trident. Poseidon’s trident was used to cause disasters (earthquakes, shipwrecks, drownings, etc) and his domain was Atlantis, which of course, was lost…much like anyone who enters this room. (Interestingly, Poseidon was also one of the fathers of Theseus, who killed the Minotaur in the labyrinth. Also, the Minotaur was conceived between Pasiphaë, wife of King Minos, and the white bull given to him by Poseidon, but none of this seems to tie directly to this room…there’s just a bit of a connection between Poseidon and the Minotaur in mythology). Could this be referring to herring as a fish? Are herrings rare/expensive/served with lots of condiments? In a literal sense, there is no such fish as a “red herring”; it refers to a particularly strong kipper, a fish (typically a herring) that has been strongly cured in brine and/or heavily smoked. This process makes the fish particularly pungent smelling and, with strong enough brine, turns its flesh reddish. I did my best to summarize where we are at with this room. We have two solid (in my opinion) solutions which could both be true but each would work better without the other. Wherever we land on this room this is an impressive effort on everyone’s part. Good job! I am upping it to four out of five but I really have no idea. That would be very sensible, I suggest instead we toss a coin…wait, we have no coins. I’ll add your question to the Ask Manson page. I’m just glad we’re finally getting somewhere. Go team! Here is what I think is going on in this room. Room 22 is unique among all the rooms in Maze in that the best choice is NOT to pick a door but to STAY WHERE YOU ARE. Think about it: on the Path, you’re trying to get to 45 or back out to 1 – there’s always a best door to pick to get you closer to your goal. 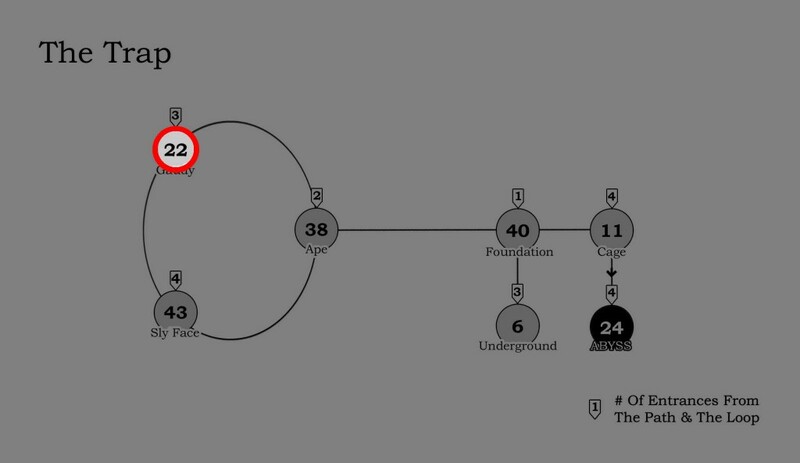 In the Loop, you’re trying to get to 41 so you can start again. In the Trap, you’ve lost the game, but you can at least get as far away as possible from Room 24. Well, here you are in Room 22. Why is it best to stay here? Your game is over, you’re in the Trap, and you CAN’T get any farther away from Room 24. Room 43 is better than Room 38 if you HAVE to pick a door, but 43 is equidistant from Room 24 compared with 22, and is a much less pleasant place to hang out, considering the lack of seating, ominous hole in the floor, jeering faces on the walls, and devil’s face above the door, not to mention the fact that the Guide’s (presumably, please oh please) malevolent and scary true identity is also hiding there. So just stay in the nice cushy room with the comfy chair and interesting things on the wall. Reference to theatrical backdrop + curtains on doors makes you think of idiom: “it’s curtains” or “ring/bring down the curtains” meaning bringing something to an end. I think the red herring sign is actually “red her-ringS” – why not plural? The individual messages on the signs are red herrings. Red comes from ideas already described: trident, stop sign, as well as word “exotic” and the Chinese-style lantern, which makes you think of the Western idea of a fancy (gaudy?) Chinese-style room – which would definitely be red. So the red herrings are the signs taken individually as room indicators: Scale and tail both point to the left, indicating door 43. H+OO indicates 38 alphanumerically or, alternatively, with the three-part H + OOs that look like 8. (These ideas described below by others.) Perhaps “LONELY ONE” in centre column of red herring sign, matching text, indicates its different function. Incredible work! By jove me thinks she may be on to something here! Well, I’ve convinced myself, anyway. I don’t know if all the details are right, but I think “Room says STOP in multiple ways; clues that seem to indicate one door or the other are red herrings.” The fact that there are reasonably sane clues for either door seems to support this. I also noticed that the “H+OO” thing, if you go of the letters position in the alphabet, H+OO=38. This could just be something irrelevant, but I think it supports your theory. I don’t know it anyone has figured this out, but it’s something interesting. It’s not just that you add the corresponding numbers all together and end up getting 38. It’s that you add the two paired Os together (15 + 15) and get 30, and then you have the H, separated by a + from the Os, which gives you 8. This seems like a much more intentional 38 than, say (sticking with the chemical theme) — ION might be. This gives you 38 as well, but it’s just a bunch of numbers that add up to 38 (9 + 15 + 14) rather than the very deliberate-seeming 30 + 8. And I feel like we’re justified in going bottom to top, and actually being able to read it as “thirty … eight” rather than top to bottom (“eight… thirty”) BECAUSE the twinned “woman’s jewelry/red herring” sign on the other side of the door is ALSO written bottom to top! Yeah, I noticed that someone else posted it almost the minute I posted it. But maybe the bottom to top thing is bigger, maybe the room is upside down, but that’s unlikely. Also, the doors kind of look like people. While I’m on the topic of doors, if you look, only the center door ‘s curtains are closed. But also in the center’s curtains, there is a line that looks like legs, helping the previous statement. BUT… I have no idea what it means…. Anyway, it’s nice to even be replied to by you. Also, even though the other signs are upside down, the scale is the only sign not upside down. I also note that a scale is a set of musical notes rising progressively that kinda look like stairs. Maybe an upside down scale show the we’re low in the house at this point? I don’t know. 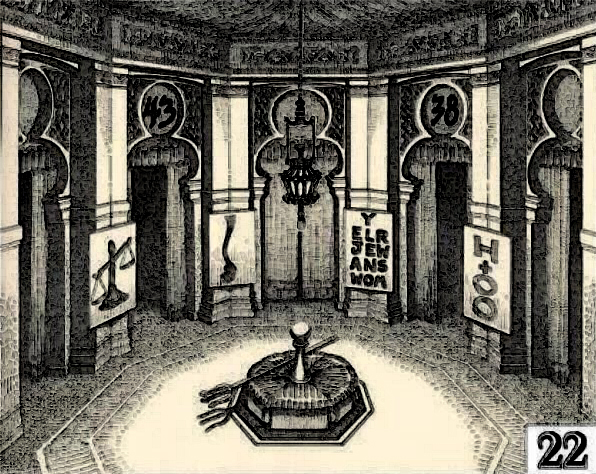 Also, do we even know that the “38″ (from H+OO) is referencing the door? Maybe it’s something else. Sorry if I was rambling. HO2 is hydrogen peroxide, although I don’t think that’s what was intended. Okay, just spit-balling here. The scale has got me thinking of the Egyptian death legend, going to meet Osiris and having your heart weighed against a feather. The story is that if the heart balances with the feather, you go to the afterlife. The scale here is obviously unbalanced. I have read that there were 43 judges you would sort of plead your worth to – though I’ve seen it elsewhere as 42 (possibly not counting Osiris). Which is an interesting number considering the door. There is of course lots of talk about judgment in the text. There is also that line about “one could spend quite some time here,” which brings Purgatory to mind, although the Egyptians didn’t have purgatory, unless you count all the time it would take to plead your innocence to 43 judges. Finally, the sign on the right, if read low to high rebus-style, could say “Os-I” which is the beginning of Osiris. That’s all I got right now, going to keep banging my head against this wall. That is some impressive historical detective work! I had a picture of this scene from the wall of a tomb hanging on my wall when I was a kid (there were hundreds of pictures on my walls, it was in there somewhere), in that carving I think it was Thoth who was weighing the heart with Osiris off to one side and a crocodile standing by to eat the heart if was too heavy. Creepy! I didn’t know that Osiris was the actual judge or that there were more judges than just him. With the emphasis on judgment in this room I think this is worth considering. Good spit-balling!